IMU 041: Why Every Entrepreneur Should Use The 4 Pillars Of Success To Live a Fulfilling Life & How Mikael Used It To Scale His Business to $5,000 Per Day In Revenue. IMU 040: How an Immigrant From India Makes Fear His Friend and How You Can Too! IMU 038: How Carolin Soldo, a German Immigrant, Tapped Into The Power of Passion To Go From Losing 80 lbs. To Getting Her First 4,000 Clients For Her Coaching Business! & LIVE The Life You Always Dreamed Of! IMU 036: Top 3 Areas Carissa Hill Focuses On When Scaling Businesses & Why Ignoring Them Will Lead a Business To a Slow Death! IMU 035: How a Polish Immigrant Who Grew Her First Business To 40K Views in 5 Months When She Was Only 12, Scales Businesses Using a Little Known Telesummit Formula! IMU 033: Esther ‘Pinky’ Kiss Shares Her Publicity Secrets For How To Get On TV, Connect With Influencers & Create Constant Publicity, Even When You’re Nobody! 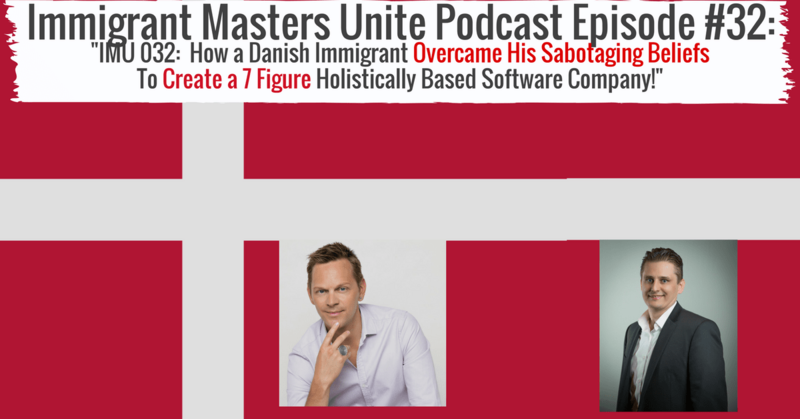 IMU 032: How a Danish Immigrant Overcame His Sabotaging Beliefs To Create a 7 Figure Holistically Based Software Company!